This is a zoom lens manufactured by Sigma and the model was launched 2009. The lens belongs to the category superzoom lenses. A superzoom lens gives you a wide zoom range, from a wider field of view (wide angle) to a more narrow field of view (telephoto) and is usually appreciated as an all-in-one travel lens. The lens has a focal length of 18-250 mm. Since the lens is designed to be used on a camera with smaller sensor ('APS-C') the focal length will be equivalent to 29-400 mm if you have a Canon camera or 27-375 mm if you have a Niko camera. The lens brightness and aperture value is f/3,5-6,3. This lens is not considered to have a good aperture value and brightness. It is something to consider before you purchase the lens. To compensate for this you might, while photographing in less favorable light conditions, be forced to either use higher ISO settings (which generates more noise in the image), slower shutter speeds (which may give some motion blur) or flash lightning. Read more at the link below what lens brightness means to you as a photographer. One thing to consider is that the lens has a variable brightness, which means that depending on how much you are zooming the lens will have a different maximum aperture value. At 18 mm the lens brightness is f/3,5 and at 250 mm the brightness is f/6,3. Through the link below you can read more about what this could mean for you as a photographer. The lens has a traditional filter thread on the front and its measuring 72 mm which also the filter you will use must have. If you use for example an UV filter can be a cheap insurance against scratches and dust. If you buy this lens it will come with a lens hood, whose model name is "LH780-04 581". The lens apeture and brightness varies at different focal lengths. Text from Sigma: "Sigma’s 18-250mm F3.5-6.3 DC OS HSM is a high-performance 13.8x zoom lens designed to let you enjoy photography through the convenience of one exceptional, compact, high quality, light weight, all purpose lens. This lens delivers all of that and amazing photos as well! 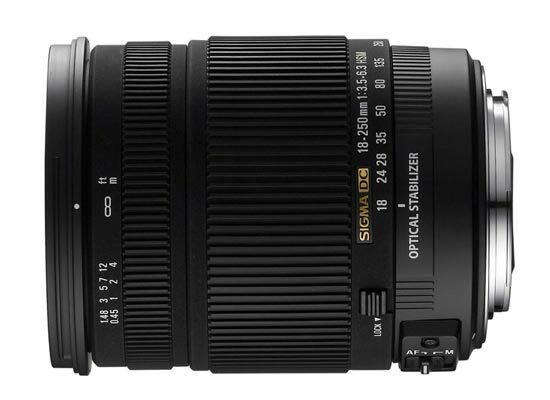 Perfect for all shooting situations, at the wide end the Sigma’s 18-250mm is perfect for scenic, landscape or group photography; at the long end it can be used for sports actions or great shot from a day on safari. Of course, you can do great candid portraits with it as well. Three Aspherical glass elements offer correction for distortion. Four Special Low Dispersion (SLD) glass provides optimum color correction and sharpness, Super Multi-Layer lens coating reduces flare and ghosting and assures high image quality throughout the entire zoom range. Roughly equivalent to a 24-400mm lens in the larger format cameras, this lens has an incredible range and flexibility and will deliver stunning images. Extremely compact weighing only approximately 22 ounces & measures only 4 inches in length.